Henry County Genealogy Alliance is brand new. My personally founded genealogy group, East Central Indiana Genealogy Alliance (ECIGA), disbanded in December 2018. From those ashes, HCGA was born. 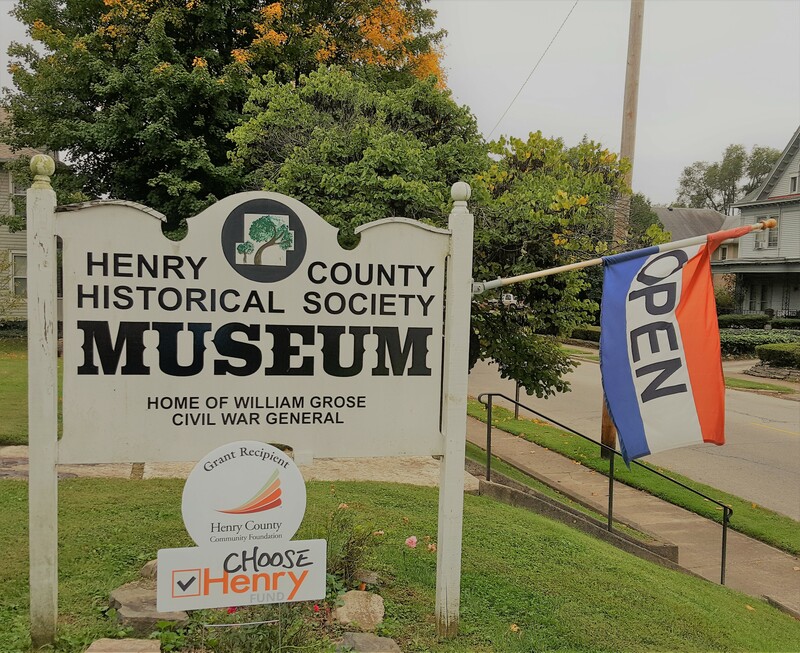 HCGA exists under the umbrella of the historical society. 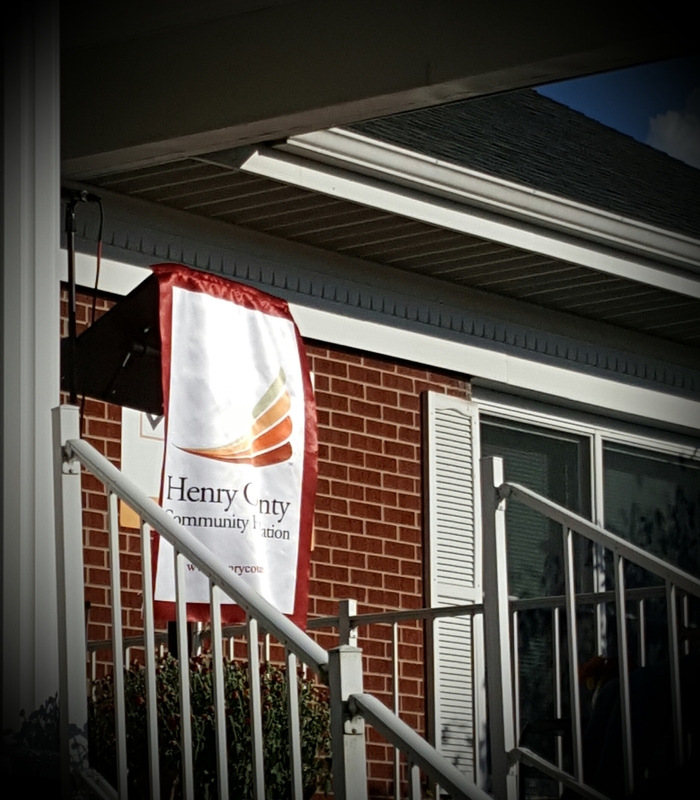 I’m not sure Henry County has ever had a formal genealogical society, to be quite honest. HCGA will have one live webinar this year AND a one-day seminar. Question for my genealogy-focused followers: What topic would you like to join for a live webinar where you could ask questions of the presenter? What kind of speakers would you be interested in seeing at a one-day seminar? Please share your ideas! Help me brainstorm! I recently had the pleasure of meeting Lori Lee Sauber…a Washington State resident with Hoosier roots. 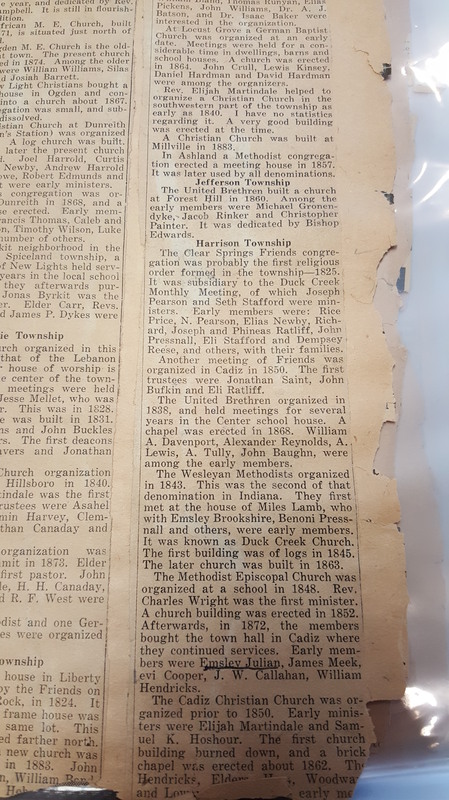 I was able to connect her with some old family documents that gave her more insight into her Hoosier ancestors’ lives in the early to mid 1800s. This is hands down the best part of my job! She contacted our historical society well in advance of her trip, enabling me to pull items for her to review, thus a major time-saver. In the photo below, only a small portion is shown of the table of items we examined. I was thrilled to be a part of her journey! Follow her story by clicking on her name above. I would be remiss if I did not tell you about the L2Scrollio! I asked Lori Lee if she could bring one so I could see it in person. I got to check out her very own L2Scrollios! She created these on her own, a very creative and ingenious tool for any researcher. And, as she conducted her research, she did refer to her L2Scrollios when determining different ancestors who had the same names. I could envision this as a very handy visual at family reunions when explaining to your cousins who your 3rd-great-grandparents are or explaining generations removed. I’m a believer! For more info, just click on her name up above. 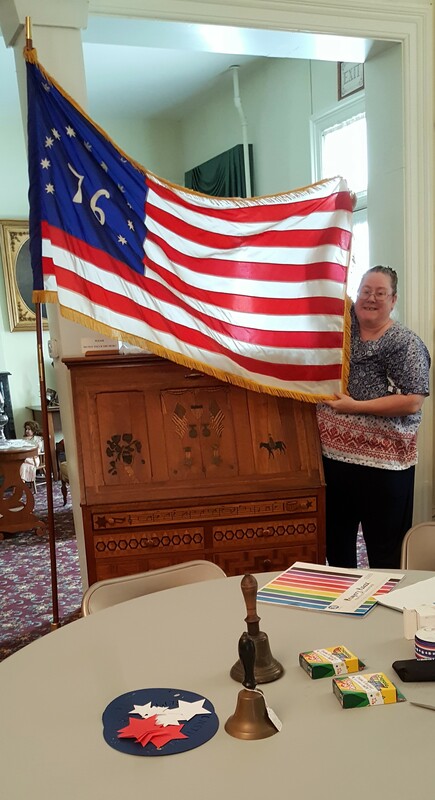 I thoroughly enjoyed spending the morning researching with Lori Lee and am so happy that she was able to visit our historical society and county. Not only was this trip beneficial for Lori Lee but I also benefited as a researcher by learning more about her ancestors, knowledge I will be able to share with future guests and descendants of this family. Win-win! Sauber holding an original document of her family’s. What Does a Genealogist/Historian Do On Her Day Off? On my way home, I drove through Fountain City and saw the sign pointing toward the highest point in Indiana. So, I decided to check it out. Believe it or not, I was not the first person there today! I also didn’t realize how close I was to Ohio. Finished up the newsletter for bulk rate mailing! If you are so inclined, go here and click on July to read the newsletter (.pdf format). Every once in awhile, a thought will cross my mind…don’t forget ProGen39!! My mind, it is a’swirlin’! My historical society took a big leap of faith and approved our entry into the StEPS Program through AASLH (American Association for State and Local History). StEPS stands for Standards and Excellence Program for History Organizations. It is a self-guided process wherein history organizations take a good hard look at policy and procedure and their future. We will receive a workbook to work on different aspects of our organization, e.g. mission and governance, audience, and collection. I am very excited about this! We plan on reviewing it through the rest of this year and actively working on what needs attention beginning in 2019. 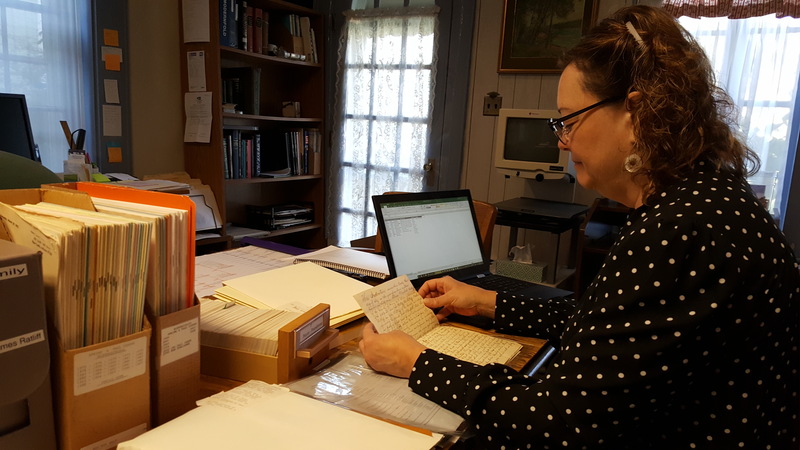 I am so grateful for the Genealogy Library we have at our historical society (named after Clarence H. Smith, some day soon I’ll tell you more about him). When I began pondering career changes, professional genealogy seemed like the path I wanted to follow. 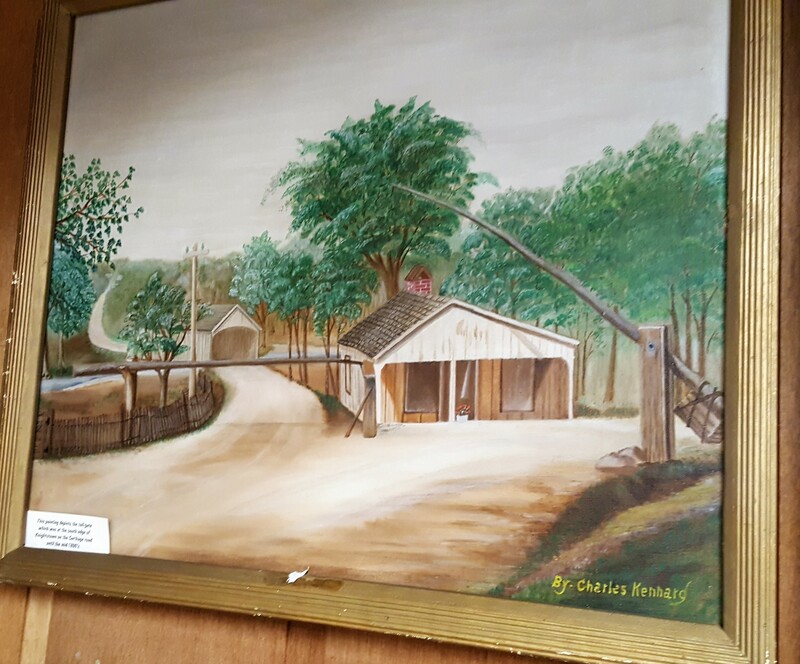 Volunteering at the historical society opened my eyes to the wonder that is our local history. This position as director fulfills my genealogical passion, as well as teaches me unique things about my county. If I don’t learn something new daily, then I consider it a nonproductive day. These new things I learn can come from any nook of the Museum…our oldest book was published in 1789…a child on a tour showed me a new piece of wood in our Thaddeus Coffin desk (made of nearly 57,000 pieces! )…a lovely weed had found its way into our entry pavilion! Even though I’m the executive director of a historical society and museum, genealogy still plays a large role in my life. That is why when I recently received the invitation to join the ProGen Study Group 39 I jumped at the opportunity. I had tentatively set aside my goal of achieving professional genealogy certification through the Board for Certification of Genealogists (BCG), but, by signing up and participating in the yearlong ProGen course of study, I believe I might move forward with my BCG goal. We’ll see in a year! Thank you to those who voted on the skeleton key poll. What do you think of this one? My creative side is paper-based. I like working with paper art. 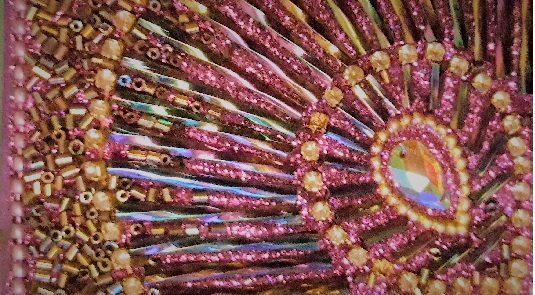 I can’t draw; I’m not great at fiber arts…but, with paper, I flourish. Ideas spring to mind, mixing colors and patterns with pictures, bringing memories to life to last, well, forever. About 15 years ago, I was putting together Creative Memories (CM) scrapbooks…loved their books and products. Loved them so much that even my then-husband even bought tools at the time so we could create books together. Time for scrapbooking fell to the wayside with the raising of our sons and working full-time and my MT career taking off, as well as my newfound interest in genealogy. Now, I’ve been yearning for some say to join the two together. Regarding CM, they had had financial issues in the recent past, and I thought they had gone bankrupt. I knew Archiver’s had closed. I do have a Cricut machine and supplies with which to make cards, but that is a bit different. On the off-chance, I did a Google search for Creative Memories. Lo and behold, they are alive and well! I dusted off all my old CM tools, which still work just fine, and gathered all my paper supplies. I then scoured their website and took the plunge. I am now a Creative Memories Advisor! My next step is to update my tools and supplies and begin scheduling workshops. I have literally 300+ photos from three events that I want to print and put into scrapbooks so I’m good there. I do have to learn more about digital scrapbooking, which is now part of CM. If you are interested in learning more about CM, check out my site. Where I am not struggling is with my genealogy life! I have since become the Assistant Director at the historical society where I put in 13.5 hours/week. I have been researching some really interesting genealogical situations and have created a digital newsletter for the society, as well as helping create our newest exhibit. ECIGA is going great…we have 15 members so far for 2018 and have a lot of great stuff on the schedule for this year. We are using our portable scanner and laptop to scan in record sets from east-central Indiana that are not digitized anywhere yet. We will have a booth at the 2018 FGS Annual Conference in Fort Wayne, Indiana…come say hi! In April, I’ll be attending the Indiana Genealogical Society Annual Conference…looking forward to that meeting and learning more! In May, I’ll be going to the Indiana DAR State Conference where I will have the opportunity to meet our President General…how exciting is that? Also, in May, my local DAR chapter and the historical society are partnering together to present 100 Years of the Red Poppy: A World War I Commemorative Event for the community. I have a lot on my plate for 2018, all of which I am thoroughly excited about. Genealogy is very important to me, as is preserving those memories for generations to come. I can help you learn your history and then preserve it! I used Smore dot com…very pleased with how it turned out! Planning A 2-Part DAR Lineage Workshop! For: Ladies 18 and up who are interested in joining the National Society Daughters of the American Revolution. I’m working on an agenda right now, plus invitations. I have the location and dates nailed down so those are a go! I hope to generate some interest and meet some new ladies. First Three Generations (You, Parents, Grandparents): Must have birth, marriage, death proof. There must be a connection between each generation, from the Patriot to the prospective member. You must have proof of residence and age for your Patriot ancestor. That’s probably enough for 2 hours. On a side note, I should be receiving my DNA data soon! Check out the Genes For Good app on Facebook. The University of Michigan is conducting a study wherein you answer a few health surveys and they test your DNA…for free! They have a wealth of information regarding privacy if you’re concerned. It does take 2-3 months to get your results back. When I tested through 23andMe, I got results back 2 weeks to the day they received the kit at the lab. As soon as I know something, I’ll write about it! I need to make a decision that I’m dreading. Not sure if I want to go in 100% or just leave 50% intact. I’m just not seeing growth and feel that there needs to be a change. I need to explore some options.